What makes hoop earrings so attractive? Well for one, you can pair them with almost anything in your wardrobe — from turtlenecks to white shirts paired with denim jeans and to midi and maxi dresses. You can even wear them to the beach with your favorite swimsuit. Show your creativity and passion for this trend and let our part 2 of this blog post inspire you to try on different styles of hoops. Eclectic. Are you experimental when it comes to earrings? Do you like to mix and match different sizes? Well then, this is your chance to combine different styles of hoop earrings so your eclectic side can shine! 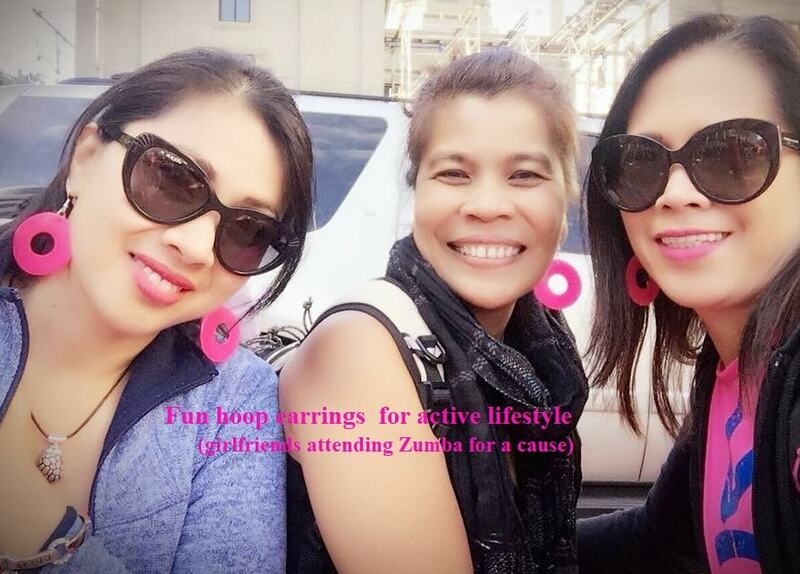 With a variety of hoops, you give off a fun and energetic vibe! If you want a more understated yet feminine take on your look, try combining three or four small-sized hoop earrings and you’re good to go! 90’s inspired. It’s impossible to mention hoop earrings without remembering the overalls and crop tops that were big back in the 90s. Up your 90s inspired look and don your favorite hoop earrings, put on some high-waisted denim jeans or shorts or better yet, the overalls! If you want to add your own twist to this era, simply wear something that show off your personal taste. Fashion-Forward. If you’re the type who want to turn heads, then a pair of bigger, more disproportionate hoops are just right for you. This is the perfect addition to your style as you will surely get everyone’s attention with a catwalk-inspired look. You may not be wearing these types of earrings more often but wouldn’t it be nice to don a pair that would bring out your fearless and daring side? Corporate. Just because you’re in the corporate world doesn’t mean that you will slack off on your sense of style. The workplace requires you to look decent and professional and small to medium-sized hoops will definitely do the job for you. Don’t hesitate to let your inner lady boss shine. Just try to stay away from bold and tacky designs that are inappropriate for business meetings let alone in the working environment. High Street. Need to spice up your outfits and want to go for high-street look? With large hoop earrings, you won’t need a standout outfit but just head-to-toe basics. So throw on your favorite jeans and t-shirt combo, make sure to accessorize with some hoops, add a few more minimal accessories and you’re good to go. Everyday Looks. Even if you’re wearing casual outfits, you can still have a put-together look. Put on your favorite sleek hoop earrings and so you can pull off a pro fashion blogger vibe. On cold days when layers are your go-to resources and dark outfits rule your wardrobe, count on your statement hoop earrings to give you a pop of color. Keep your hairstyle simple and let your hoops do the talking. It’s not practical to spend all your money to buy hoop earrings so you can style your outfits. Just know the right hoops to add to your collection, a nice pair that you can wear plenty of times. Think outside the box and choose one that could amp up your look on any occasion. Be it hoops that have colors, spikes, studs, or wrapped fabric, the possibilities are endless. So, have fun wearing and styling your favorite hoops!